On April 22 and 23, Web Services hosted the first southeast regional for the Higher Education Web Professionals Association. 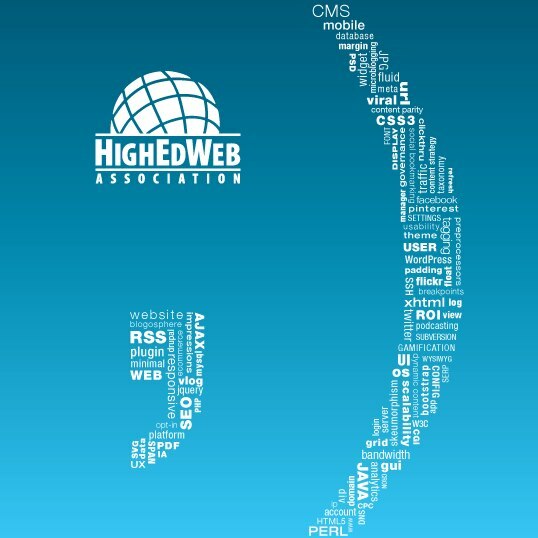 HighEdWeb Florida brought content specialists, social media managers, web designers, programmers and managers together to discuss web communications, marketing, and more. We had attendees from as far away as New York, North Carolina, and Louisiana, as well as quite a few of our colleagues from the University of Florida campus. Our initial feedback has shown that our attendees enjoyed the conference and got quite a few useful ‘golden nuggets’ to help them in their everyday work. Daniel Ryan’s keynote talk on Human-first Web Design helped open my eyes to the need for web developers to have methods in place for measuring visitor engagement on their sites, and how to use that data to make informed improvements. His talk outlined the increase in traffic, donations, and user social engagement on the Barack Obama 2012 campaign website as a result of lowering technical barriers, experimenting with content changes, and meticulously analyzing data. We may not be in the business of raising presidential campaign funds, but I believe analyzing data on visitor behavior should be just as important to us. With this knowledge, we can focus our efforts to building a better web experience for our audiences. I really enjoyed Kyle James’ presentation, SEO for the Modern College Newsroom and the no-nonsense, actionable takeaways he left at the end of his presentation. SEO and social go hand in hand, and both are important for marketing and digital advertising. As a social media coordinator, I believe I need at strong working knowledge of SEO — and Kyle’s presentation definitely helped with that. One of my favorite takeaways from the presentation was that search engine crawlers are the “3 blind mice”, and they certainly don’t care how beautiful your website looks; they only care if the content is relevant and fresh. As Kyle said, content is an annuity, so making regular “payments” of good content with relevant keywords can pay off in the end. I think the one thing I that was reinforced for me was that college/university websites really need to have the balance of what the organization wants and what the user is looking for. I learned from Dave Olsen’s Optimizing your site’s web performance for the coming device-pocalypse that site performance is an essential part of user experience and will scare visitors away if your site takes too long to load. Performance improvement isn’t just something to be attached at the end of a project lifecycle; it should be take into consideration as early as design phase. The HighEdWeb Florida regional conference was full of great information. Some new information and some information that was known, but maybe not in the forefront of our everyday knowledge. For example, listening to Kyle James talk about always using Alt text on images is something I talk about every day. But he also went on to say that in addition to that we should use good descriptive filenames for our media. Don’t just add an image with the file name DSC00392.jpg, but make sure it makes sense to both a user and a search engine. Use keywords like uf-dance-marathon. This makes sense for any search. Whether a user is looking at a filename or a search engine is reading that file name, we certainly have a better idea of what we will get with a filename using keywords than the camera generated file name using letters and numbers. From Daniel Ryan’s, Human First keynote: Outside of reinforcing our thoughts behind the power of testing and analytics in making refinement decisions to our designs and products, the stickiest nugget for me has been the stat around web forms. Specifically the idea that for each field you add to a form, you can lose as much as 10% of your conversion rate. We must always ask ourselves what we plan to do with this data, and is it absolutely required that we get it now, versus a subsequent follow-up with the submitter. I was very impressed by Carrie Phillips’ and Brent Passmore’s presentation on You’re Shooting Video on an iPhone. Their workshop showed how it’s possible to shoot and edit high-quality video on an iPhone. With the demand for multimedia ever increasing, a hand-on sessions that shows how to use the tools at our disposal without having to invest in more resources could not be more timely, especially in higher education where every penny matters. One of the things that seemed to come up again and again is user-centered design. Specifically, design your site centered around a single purpose. What is the call to action you wish your customers to fulfill? I think for us the singular purpose for UFandShands.org has been to convert the curious to customers and get patients through our doors. Whether that be through an easily accessible Request an Appointment button, rich information, or, as Carlos Morales mentioned in his connected content presentation, smart linking throughout the site so users can find what they’re looking for, we need to keep refining the site so users never feel as if they’ve reached a dead end. We want our users’ entire experience to be seamless, effortless, and ultimately successful. Both for them and for us. Daniel Ryan brought up Jackob Nielsen’s quote “You are not the user”. I think time and time again this point gets lost on us because we tend to get so caught up in bouncing ideas off each other and taking ideas from leadership that we forget about all the people for whom the sites are mainly intended for. So my big takeaway from Daniel’s talk was don’t make assumptions about your users. And in those cases where you might have to make an assumption use data to back it up. If you were unable to attend the conference, most of the presenters’ slide decks are available on the conference’s website. In addition, you can hear about some of the highlights of the conference from attendees on the April 25th episode of HigherEdLive. HighEdWeb Florida is hopefully first of many annual southeast regionals, and Web Services will let you know if and when a regional is announced for 2014. In the meantime, keep sharing your experiences and knowledge with us and with your colleagues, as through sharing, we help to make the experiences of our users ever better.